With just two weeks to go before the release of the 2016 Mercury Dime Centennial Gold Coin, the U.S. Mint has shared new images of the issue, along with its mintage limit and household order limit. While we won’t know the cost of the item until closer to its April 21 launch-date, we now know that its mintage will be limited to 125,000 pieces and that orders will be limited to 10 per household. The coin will feature a “business strike” finish, approximating the look and feel of the original 1916 circulating dime, and will measure .650 inches in diameter and .047 inches thick. The Winged Liberty dime was designed by Adolph A. Weinmen. It’s obverse features an image of Liberty facing left and wearing a winged cap; Liberty’s resemblance in this design to the Roman god, Mercury, led to the issue being nicknamed the “Mercury dime.” Inscribed along the rim are LIBERTY, IN GOD WE TRUST, the artist’s initials, and 2016. The coin’s reverse bears an illustration of a Roman fasces with an olive branch, along with the inscriptions UNITED STATES OF AMERICA, E PLURIBUS UNUM, ONE DIME, the West Point Mint’s “W” mint mark, AU 24K, and the item’s weight, 1/10 OZ. The gold Mercury dime will be the first of three reissues celebrating the centenary of the first appearance of three classic circulation coins. The 1916 dime, quarter, and half dollar — originally 90% silver and bearing designs known as “Winged Liberty,” “Standing Liberty,” and “Walking Liberty,” respectively — will all be issued in .9999 24-karat gold this year. The reissues will vary in size, roughly in accordance with the dimensions of the original pieces. As noted above, the Mercury dime will come as a 1/10 oz. piece, while the Standing Liberty quarter will be 1/4 oz. and the Walking Liberty half dollar will be the largest at 1/2 oz. Release dates for the latter two issues have yet to be determined. 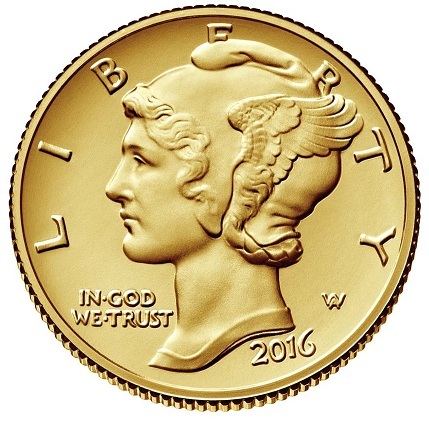 For more information on the 2016 Mercury Dime Centennial Gold Coin, please visit the Web site of the U.S. Mint. So this won’t be the same size as the mercury dime then! The mercury dime is 17.9 mm, which converts to 0.7047 inches. This article says the gold merc will be 0.65 inches. One might like to slip this into the 1916-D slot in a Dansco album of vintage mercs. I assume this 0.05 inch discrepancy will make that impossible. The half should have been made to the same specs as the gold Kennedy half. Stupid mint planning creates oddball issues that don’t hold up well over time. @Brian – because gold is heavier than silver and this coin is 1/10 oz, I am assuming that if they made it the same diameter as the Mercury Dime, it would have been too thin to stamp with their dies. As it is, from the photos (or is that just a computer-generated image?) there is not enough detail for the Mint to produce the ‘full split bands’ on the reverse, which are visible on uncirculated mercury Dimes. The article erroneously notes that the obverse has the West Point “W” mint mark, where in fact that is Adolph Weinmen’s initials; the reverse has the mint mark. @Mammoth — There is no reason the mint couldn’t reproduce the full split bands, which look pretty clear in the image. 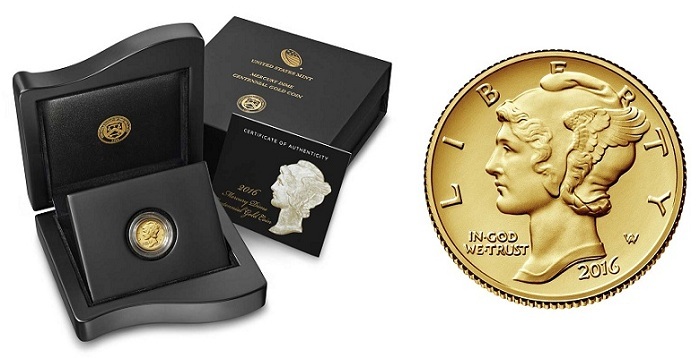 Since gold is 87.2% denser than 90% silver, the gold dime in 1/10 troy oz., the quarter dollar in ¼ troy oz. and the half dollar in ½ troy oz. must be smaller in diameter and/or thickness than their 90% silver counterparts. These gold coins will be the same sizes and weights as the 2008-W fractional gold buffalo coins. The 1/10 troy oz. gold coin has diameter of 16.5 mm & thickness of 1.19 mm. The ¼ troy oz. gold coin has diameter of 22 mm & thickness of 1.83 mm. The ½ troy oz. gold coin has diameter of 27 mm & thickness of 2.24 mm. any clue as to the cost of the gold mercury dime? A business strike finish? What genius made that decision? I’m sure the inferior finish won’t be reflected in the price. The matte finish can be every bit as tedious to product as proof. Its essentially a matte proof. This is the same for all NCLT from US Mint. True business strike would be like the UNC sets. Were are in the 21st Century. 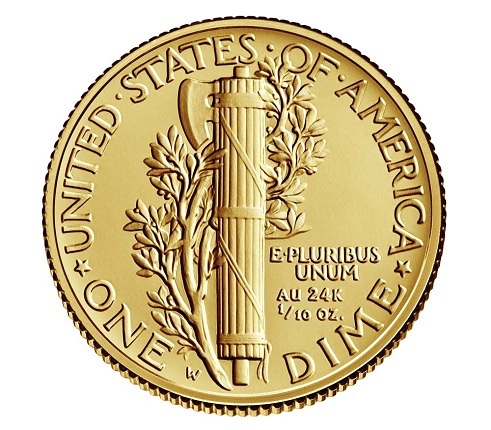 I thought the U.S. Mint, could have stamp the Gold Liberty Dime better then they did in the 20th Century. The Bands look bad on the reverse of the coin. You can’t tell if they are bands or not an not split. Another Bullion Coin, just what we need. I can’t understand this massive bullion production going on. Is it some sort of economic policy? The Fed floods the world with money and are they trying to mop it up with Gold and Silver? It’s an odd concept.Imagine the fun if Gold and Silver drop down to early 1990’s levels.